Most people dream to get scholarship abroad in order to pursue different levels of study. To succeed in scholarship is not easy, but you can make it if you know how to go for your dream. This article may tell you some tips or steps on how to apply and get scholarship. You need to know what field or subject you want to involve, which university you want to attend, and whether you are applying for scholarship or fee payment program. When you have clear answer on these questions, you may get into the scholarship or school official webpage in order to get the information on what you need to do for applying. Then, you can start planning your time to fill in the required documents. Identity documents like passport with valid date, national identification and so on. In order to get shortlisted, you have to try your best to answer each questions by showing the selection committee your passion and motivation through your writing. 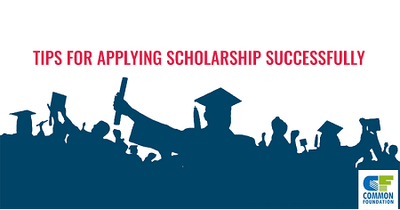 Importantly, Make sure your application arrives before the deadline of the scholarship as your application will not be considered after the deadline. You may check your email regularly to ensure that you can response or get any updates about your application. In most cases, if you are qualified for the next step, you may be notified by email. Good luck for your scholarship applying. Common Foundation Pvt. Ltd is a career based educational consultancy based in Putalisadak, Kathmandu( Opposite left of Kumari Bank) can be contacted at 01-4010675, 9845536915. Till today, there have been 14891 visitors (24990 hits) on this page!